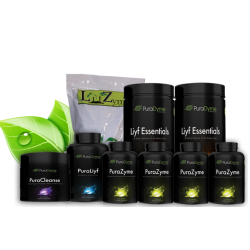 PuraDymes OPTIMIZE Program was designed to optimize a healthy diet and lifestyle, allowing for better absorption of nutrients, while aiding in the bodies natural elimination process! Based on a 30 Day Supply. Cleanse 10 oz 1 Tsp (4 Caps) : Take Cleanse upon waking & 1 hour before any consumption. This product is designed to aid in improving intestinal function. LiyfZyme 500ct 5 Enzymes with every meal: Digestive enzymes which will increase the life in your food by aiding in breaking down the nutrients for better absorption. PuraLiyf 180 6 Caps at bed: Literally the life in your food! Probiotics are an essential component of digestion and prevention of disease. OPTIMIZE Products can be exchanged for powder or capsules at your convenience. Additional charges may be applied to price to reflect these changes. was designed to enhance a person's daily diet & lifestyle for improved digestion, & assimilation of nutrients. Ideal for those struggling to embrace a pure clean lifestyle. Cleanse 10 oz. 1 Tsp (4 Caps): Take Cleanse upon waking & 1 hour before any consumption. This product is designed to aid in improving intestinal function. LiyfZyme 500ct 5 Enzymes with every meal: Digestive enzymes increase the life in your food by aiding in breaking down nutrients for better absorption. PuraLiyf 180 6 Caps at bed : Literally the life in your food! Probiotics are an essential component of digestion and prevention of disease. ENHANCE Products can be exchanged for powder or capsules at your convenience. Additional charges may be applied to price to reflect these changes. was designed to assist the body in natural recovery from premature degeneration caused by toxicity through poor diet & unhealthy lifestyle choices. Cleanse 10 oz. 1 Tsp (4 Caps) : Take Cleanse upon waking & 1 hour before any consumption. This product is designed to aid in improving intestinal function. LiyfZyme 1000ct 10 Enzymes with every meal: Digestive enzymes increase the life in your food by aiding in breaking down nutrients for better absorption. REGENERATE Products can be exchanged for powder or capsules at your convenience. Additional charges may be applied to price to reflect these changes. These programs are designed around the normal use of nutritional supplements, your health care provider may increase or decrease dosage based on your condition or requirements. Depending on your current state of health you can find a preset program that suits your needs or contact PuraDyme directly for assistance in creating a custom program around your budget or goals. All programs assist the body in improving nutritionally and detoxifying through natural means. A cleaner body will utilize more nutrition and naturally improve basic functions providing relief from chronic degenerative conditions and illness. With 3 designed packages created based on various diets and lifestyles, you are sure to find one that suits your needs!